Our founder, St John Baptist De La Salle, instructed his Brothers to "Often remind yourself that you are in the presence of God." The spiritual life of our academy is directed by the belief that we see God in each and every member of the community. To this end we are an open and inclusive community who welcome pupils of all faiths. Our school motto is "Semper Fidelis" "Always Faithful"; this is recited at the start of every morning and afternoon. 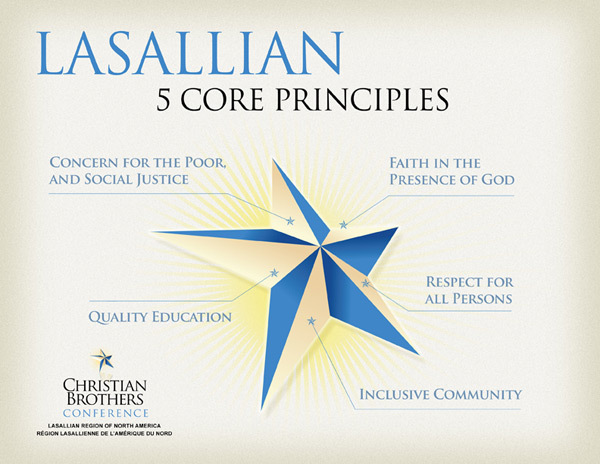 This reminds us that as a Christian Academy in the Lasallian tradition our work and play is rooted in faith in God. Each Core Value is reflected upon on a monthly basis within form time and the assembly programme. Further opportunities for spiritual development of our students is available through participation in the Lasallian Summer Camp at St Cassian's Kintbury, our Lourdes Pilgrimage, retreat days, and Founders Day Mass. Bro. Sean, is an integral part of our community. He spends two mornings a week with us in a Chaplaincy role. Religious Education is at the core of the curriculum. Pupils at KS3 follow the syllabus 'People of God: Called to Serve'. At KS4 pupils follow the Edexcel (1-9) Specification A.